The hottest Korean boy band is coming to Singapore in January, and fans in the country are going insane. According to ST, tickets sold out in less than four hours, and fans had reportedly begun queuing five days prior to the day tickets went on sale. 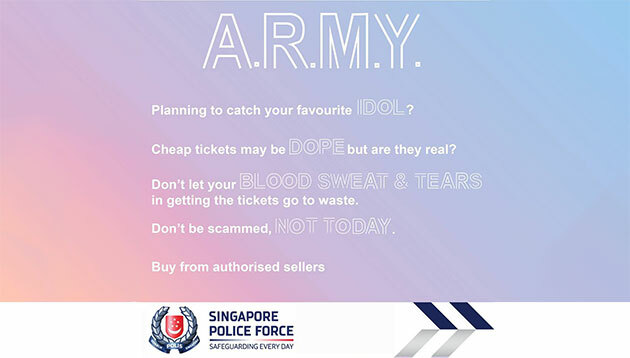 To notify the members of the public about scams, Singapore Police Force (SPF) has put up a post to spread awareness about BTS’ tour tickets scam circulating online. SPF wittily slid in titles of some of BTS’ hit songs, such as “Idol”, “Dope”, “Blood, Sweat & Tears”, “Not Today” into its Facebook post. The post garnered approximately 968 reactions, 928 shares, 194 comments at the time of writing. “Planning to catch your favourite Idol? Cheap tickets may be Dope but are they real? Don’t let your Blood, Sweat & Tears in getting the tickets go to waste. Don’t be scammed, Not Today. Buy from authorised sellers,” the post read. The post largely garnered positive reactions. One netizen praised the marketer behind the post and requested to give that person a raise. Marketing has reached out to Singapore Police Force for comment. Using a similar tactic last week was Malaysian movie house TGV Cinemas. The company creatively weaved the titles of some of BTS’ hit songs, such as “Not Today“, “Blood, Sweat & Tears“, “Fire“, “Fake Love” and “Love Yourself” into the Facebook apology for not being able to screen a movie by the band. The post garnered about 1.2k reactions, 252 comments and 480 shares at the time of writing. The Korean band recently made it to the cover of Time Magazine and is now a worldwide sensation. The team of seven gained popularity over the past few years, collaborating with companies such as PUMA, Facebook and Coca-Cola.